We’ve talked to several agents who aren’t “great salepeople,” and they’ve found it easy to list inherited homes. They are easy to sell for two reasons. #1. The owners are motivated to sell — so they can get their hands on the money! #2. 67% of inherited homes have the mortgage paid off. The huge challenge (and opportunity) to listing inherited homes. I’ll also show you how to overcome that challenge. 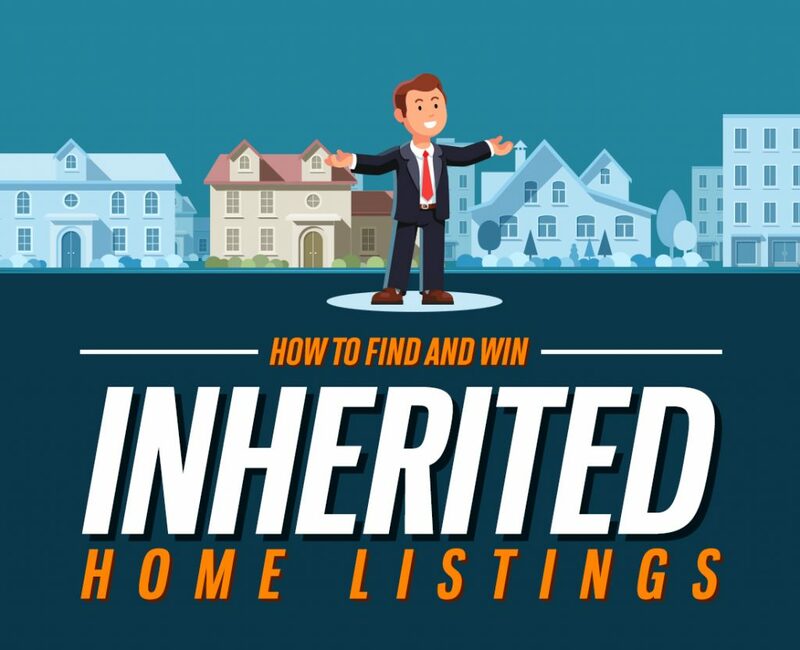 3 different ways you can find inherited listing leads. How to get the inherited homeowners to list with you. How to automate the entire listing process. Reason #1: There are a lot of inherited leads. Here in Jacksonville, Fla., there are over 4,000 inherited homes. I’ve seen about 2,000 of those in court records. That is a huge number of motivated sellers to choose from. The ones who have inherited the property are often eager to sell. They do not want to continue to pay property taxes on a home they don’t live in. So, when you come around offering to help, the odds are good they’ll be open to listing with you. Every niche in real estate will have challenges and opportunities. The challenge here is in finding the inherited home listings. This is also an opportunity for you. Other niches in real estate are easy sources of leads, such as expireds and FSBOs. Almost every agent out there is calling those same leads. There are a couple easy ways to find inherited leads. You can buy them from sites online, or you can go local. When buying leads, remember that not all leads are created equal. Make sure what you’re buying is from a reputable site with quality leads. Searching local may require some more work on your part, but you’ll find better results. Here’s some more details on how to go about finding these homes. The third strategy is more time consuming and a bit more work but will get you lots of great leads. You can go to your local courthouse website for this information. On the website, you’ll typically want to search for public records. If you have trouble finding them on the website, you could try a more specific Google search. Do a search for your county probate records, and it may direct you to the exact page on the county website. Once you have your leads entered in your database, it’s time to send them your book. You can find the cover letter here. Put that inside your book, and you can mail it out to your leads. For this niche, you’ll want to use one of the Inherited Books and cover letter. Once you’ve become an inherited homes pro, you can automate the process to make things run more smoothly and efficiently. Google Sheets are a great place to start. They can easily be accessed anywhere and shared if necessary. You can track all of your leads and follow up on any communication you have with them. Keeping track of your leads is one of the most important parts of being successful in real estate. It’s all about being there at the right place and right time. So be sure to stay on top of your leads. Question: How can you tell if it’s a life estate? And what does that mean? Answer: It should show on the appraiser’s website whether it’s a life estate or not. You can always cross reference with obituaries if you’re unsure. Basically, a life estate means the owner is still alive but wants to prepare and have the house go to a particular person when they pass. So, the owner is still living and in the home. We see agents make several mistakes with inherited homes. Here are some things to avoid and keep in mind. Don’t send your book to spouses or parents. They likely won’t want to sell the house, and they won’t be pleased with you for suggesting the idea. Empathy is very important, and you have to tread lightly. If you do end up sending mail to a spouse or parent, apologize, genuinely. #1: Find the leads. You can go to the property appraiser’s site, estatesales.net or your county courthouse. Remember, cross referencing your information is always a good idea. #2: Send your book. Order your book, edit your cover letter and include it with your mailing.